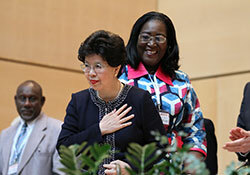 The Health Assembly yesterday appointed Dr Margaret Chan to a second five-year term as Director-General. In her acceptance speech to health ministers and representatives of WHO’s Member States, Dr Chan pledged continued commitment to improving the health of the most vulnerable. Experts from Australia, Italy, Japan and the United Kingdom, four countries with large populations of older people, described steps under way to adopt more age-friendly approaches and improve the health of this group. They highlighted the value of involving a range of sectors and establishing integrated systems of community care. Discussions in Committee A focused on the report from the Consultative Expert Working Group on Research and Development: Financing and Coordination (CEWG). CEWG was established in 2010 in response to a concern that insufficient resources were being devoted globally to research and development to address treatments for diseases that mainly affect developing countries. A group of countries, chaired by Thailand, was established to draft a resolution to bring forward the conclusions of the report, and will reconvene today.